10 Master Pieces for Solo Piano. Arranged by Larry Dalton. Modern Christian: Sacred. Collection. Published by Word Music (WD.080689386381). 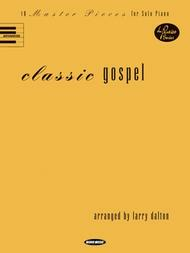 The third folio in Word Music's new Artist Series features ten well-known gospel standards arranged by Larry Dalton. Larry is a popular Steinway concert artist, who travels and performs extensively throughout the world. He has designed these arrangements especially for the more advanced pianists who need more challenging performance pieces to add to their repertoire. His heart for worship is captured in these exquisite solo arrangements of well-known gospel songs that pianists will love to play and congregations will love to hear. I was so excited to find these arrangements. Mr. Dalton has done such a wonderful of giving these a true gospel flavor! If you are interested in great music with great style, you will want this book! January 17, 2009 Great songbook to have under your seat.